Police said floating objects had been seen in the water, but they were unable to confirm whether they were from the light aircraft that disappeared from radar Monday night off the coast of Guernsey as it made the journey from Nantes. "After all this time, the weather's quite cold, the water is very cold out there … I am not expecting anyone to be alive," Channel Islands Air Search chief officer John Fitzgerald told The Associated Press. "We just don't know how it disappeared at the end of yesterday. It just completely vanished." Cardiff announced it had signed Sala for a reported 15 million pounds ($ 26 million Cdn) through 2022. He was in Cardiff last week to finalize the transfer, which was awaiting international clearance. The Premier League did not respond to questions about whether the transfer had been completed. 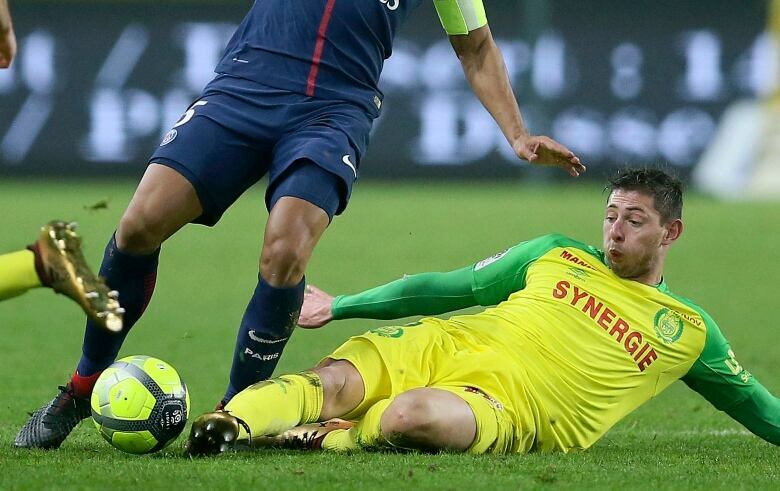 A powerful and direct player, Sala equaled his career-best total of 12 goals — achieved in the past two seasons with Nantes — in 19 league games this season. He is fifth-highest scorer in the French league, one behind Paris Saint-Germain forward Neymar, who is the world's most expensive player. Cardiff also cancelled its training session scheduled for Tuesday, with chief executive Ken Choo saying club officials were "very distressed about the situation."